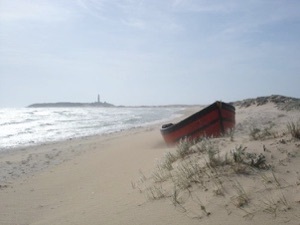 Tarifa (Andalusia) is situated at the southern tip of Spain, about 45 min by car from Gibraltar to the west. At this point the Mediterranian Sea meets the Atlantic and the more brownish beaches of the Costa del Sol change into the white sands of the Costa del la luz de Cadiz. On the other side of the ocean, only about 15 km away, you can see the coastline of Marrocco. You can fly to Tarifa from Germany / UK via Malaga or Jerez del la Frontera (both about 2h away by car). 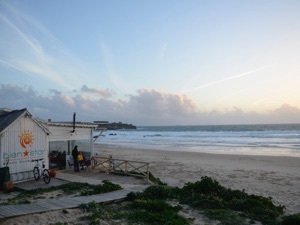 Tarifa is well known for its surfing community. Already in the 70/80ies this small town was very popular with windsurfers from all over Europe. There is still a bit ‘hippie flair‘ associated with this place. 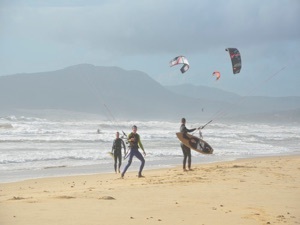 Windsurfers, however, are a rare species at Tarifa Beach, which has been almost entirely occupied by kitesurfers these days. 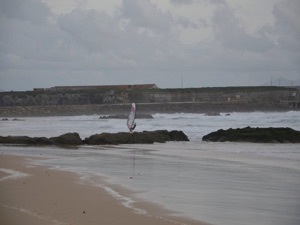 Windsurfers can be found now a bit further to the west at the Hurricane hotel or at Valdevaqueros, the western end of the bay along the N-340 (GPS Google 36.067416, -5.684191) and the beach in Bolonia (36.067416, -5.684191). For Playa Bolonia take the exit from N-340 to CA 8202 some kilometers from Valdevaqueros heading west prior to the Hotel San José del Valle. 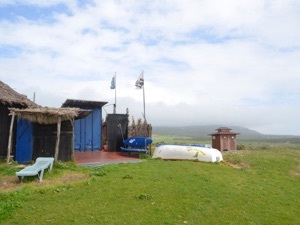 If you want to rent some equipment you will find several stations, with new equipment a bit outside from Tarifa (eg. 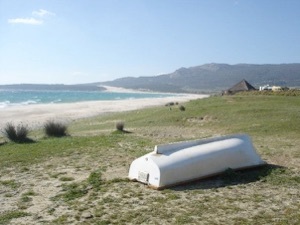 at the Hurricane Hotel), at Tarifa Spinout or even in Bolonia. 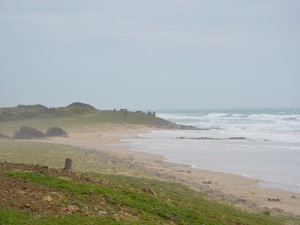 Challenging conditions can also be found further on to the West near Point Trafalgar (Caños de Meca) (36.186591, -6.019207). Follow the N-340 an A-2230 via Vejer de la Frontera to Caños de Meca (1h from Tarifa). 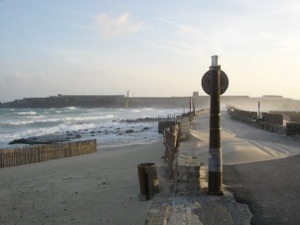 Or take the scenic coastal route via Zahara de los Atunes via N-340, A-2227, 2231 & 2233. 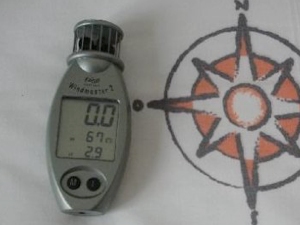 The prevailing wind direction is normally westerly (sideshore from the right). The wind can be really strong as shown on our pictures. One day at the End of March it reached 9-10 bft accompanied with perfect sunshine and about 15 degrees celsius. We had many days with 8 bft and I first thought I would never go out there. 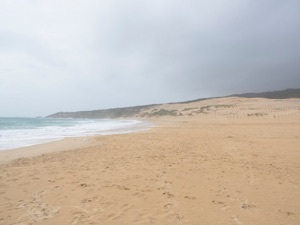 However, when we went windsurfing in Bolonia the currents flowed in the opposite direction of the wind (from East to West), so that you would experience only a limited drift on the water and the sea was comparably flat. The guy at the station recommended a 3.3 sqm sail for me (70kg), which I had never used before. Surprisingly I was able to cope with the strong winds on the Starboard Evo (80l) I had also rented from the station. 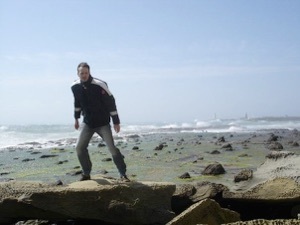 There was no huge shore break, so that we could easily enter the water. Once on the board, the strong winds brought us immediately into planing mode. Brilliant ! Out on the sea, the dark water build up to a substantial swell and it looked quite scary. 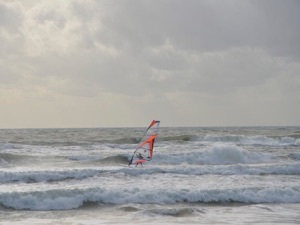 We would definitely recommend to windsurf or kite surf only together with some other people as it otherwise could be quite dangerous out there and there is always the possibility that something happens. We had a broken part at the mast foot of my friends rigg and the hook of my downhaul broke, so that the tension of my sail was gone within seconds. Luckily, we were both on our way back to the shore and not to far out on the sea. There are numerous appartments and hotels in and outside Tarifa, but we would recommend to stay in the town to enjoy the restaurants & bars in the evening without the need to use the car. Anyhow, you need to be aware, that during high season you may spend a lot of time in the traffic jam, either going to the windsurf beach at the morning or when you go back to town in the afternoon or evening. Do not miss out to visit some of the touristic highlights in this region: we can recommend to travel along the coast to Cadiz, which is an impressive old trade port. On your way you will pass beautiful rural areas. Sevilla and Gibraltar are very interesting as well and Grenada is supposed to be worth a visit too.